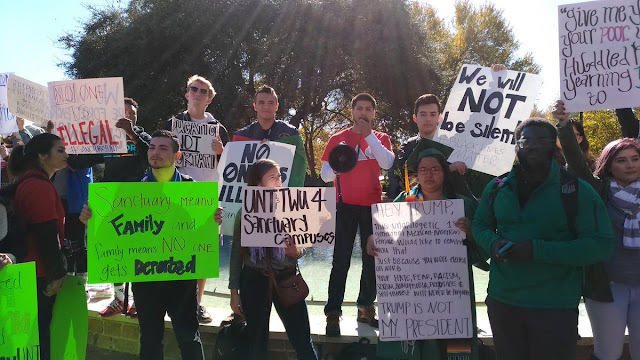 University of North Texas & Texas Women's University students held a demonstration for campuses to be named a "sanctuary campus." Stay up to date with local elections because those results will impact you directly. Urge your family and friends who are able to vote to exercise those rights in local elections. Think about the emotional impact of those who are the most affected by Trump’s statements, young kids who are worried for their parents, parents who are stressed about their situations, and yourself and your mental and physical health. Find local advocacy groups and charities that support undocumented families and provide emotional sustainability. Here in North Texas, Catholic Charities supports undocumented families with their Families First program that provides counseling resources to those who need it. Know your rights if you or someone you know is ever questioned by law enforcement. Immigration and Customs Enforcement officers (ICE) are prohibited from racial profiling, by law they cannot detain or question you based only on your appearance. Do not give false information or false documentation because they can be used against you. If an ICE officer knocks on your door they cannot enter your home without a warrant from a judge. Advocacy groups sometimes offer seminars for people to become educated on your rights and staying protected. Stick together. We can only overcome the oppressors when we are bigger than their hate. As much as I personally would love to riot and destroy systems that hold me back, it’s not realistic because I realize my status is a weapon used against me. By law, I don’t have the same rights as citizens but I plan to stay united with my undocumented community to make this transition of power as livable as possible.